I would like to "Thank all of you" for sweet birthday greetings! It truly makes me happy reading all your comments. I hope you all enjoying the LOVE month! Oh yes!! Can you believe its February already? I can't! 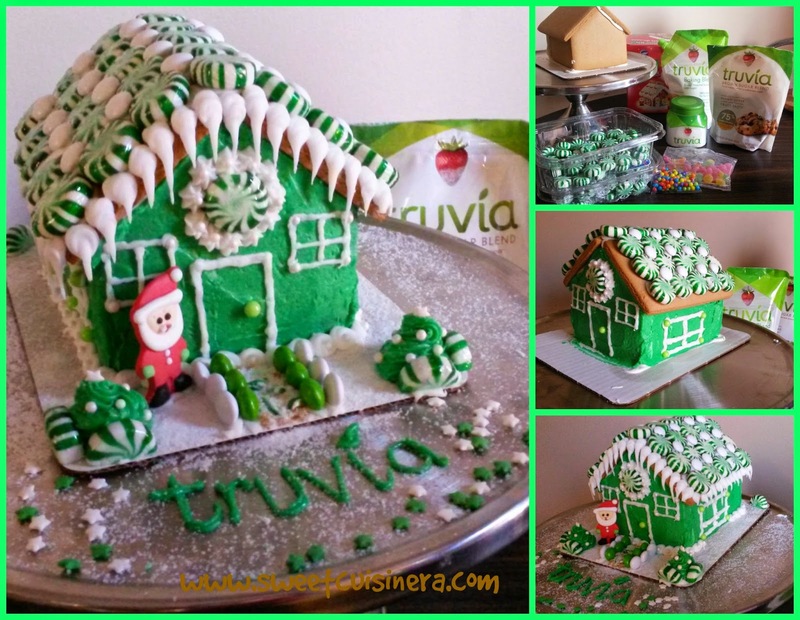 So, let me take you back to December (hahaha) were I submitted my entry for Crowdtap and Truvia Geingerbread house contest. Yes! I did participate and luckily I was crown to be their grand prize winner!!!! Wohhooo- and I'm sharing that excitement with you all. Let's go! This is my second time, winning the Grand Prize from Crowdtap and it felt AMAZING! !- You may remembered not too long ago that I won a Grand Prize Weight Watchers cooking along with Ana and Laura. This time around its all about being creative and having fun at the same time. 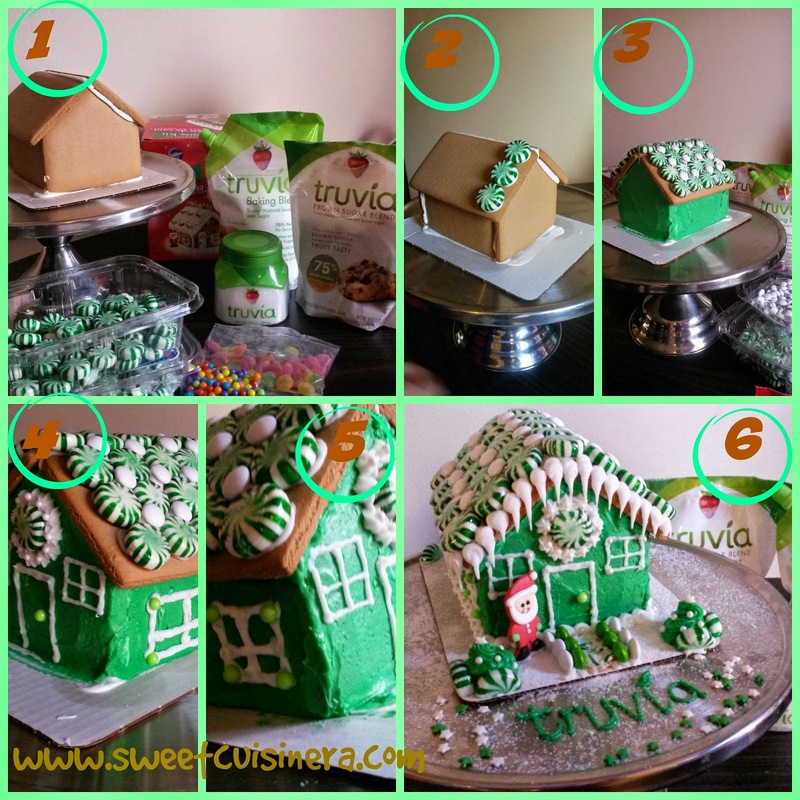 The Challenge was to create a Truvia inspired gingerbread house, with that being said, the theme for my gingerbread house will be "White and Green" So come on you guys! Join me as we make together my "Truvia inspired Gingerbread House! - In large bowl cream the butter and the cream cheese together. ( I used electric mixer on this process) Add the Truvia baking blend sugar for sweetness and consistency of the icing. At this point you can add the food coloring and set the icing aside. 1.) Take out the Gingerbread house kit out of the box and lay it on the counter OR put it on the cake holder. 2.) Start by squeezing little icing on the roof top of the gingerbread house. Add the candy of your choice. You might need to press little bit more to avoid the candy from falling out. Repeat the whole process until everything on the top is covered. Then, add little white candies to cover up the areas which was not covered with first layer of candy. 3.) Covered the whole house with green icing. Smooth it out using the spatula. Then you can start pipping the windows and the door of the gingerbread house. 4.) Be creative and have fun decorating the whole house. I did pipe icicles to have that great effect on the gingerbread house. 5.) Add some sprinkles, candies as you may like. Lastly put little Santa Claus on the side. 6.) I add some Truvia sugar blend all over to make it look like real snow and Whola!! Truvia Gingerbread house is ready! 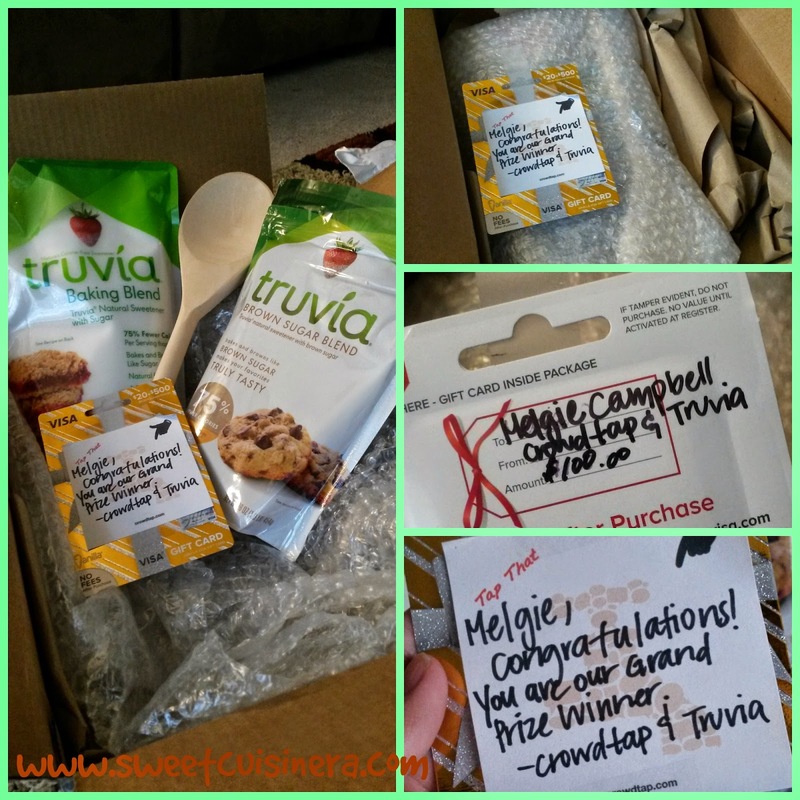 Last week of January, I got my Truvia Grand Prize Win delivered in my front door by FedEx. I'm extremely excited that I have to jump numerous times and then I open my prize!! The prize was packed perfect! Come on lets take a peek what inside! Making the gingerbread house with my kids and my friends around is amazing! I love how the idea put together into a very cute gingerbread house. The whole experience is great and I had so much FUN doing it. If ever given a chance to do it again... count me in! !I'm in-love making gingerbread house. Have I told you that this is my first gingerbread house?? O yes! So, next time you make a gingerbread house keep this inspiration in hand and just be creative. Enjoy the rest of the day and I'll see you in few days for sweet recipes and much more excitement! Conngratulation! You deserved the prize. You are so creative! My mom is visiting your site din pala. :) Anyway, I love to make this activity too but the ginger bread kit price is P1k+, no way. Very nice ginger bread house. I love the candy roof! But my favorite detail is the snow designed cream/frosting? Very beautiful! Congrats for winning.. I always wanted to make something like this. I hope I could one day! The gingerbread house is very nice! Congrads on the win..those are really lovely prizes you got. Cute looking gingerbread house you made. congratulations! I am digging the green house and the icing!!! Oh this is so nice!!! Congratulations on winning! This is so creative! btw, cute your cursor turns into a coke in can? am I right? ohemgee!!! I love the gingerbread house!I have wanted to do this ever since I was a kid!!! Wow! That gingerbread house looks soooo cute and yummy! I'm so envious of women who can do great in the kitchen! Obviously, I'm not one of them.. lol. Thank you for sharing your recipe! wow! Congrats! That looks awesome! Did you make the Santa, too? Congratulations for winning the grand prize. You really deserve it because you did a really beautiful gingerbread house. Also, let me greet you a belated Happy Birthday. More blessings to come. Congratulations in winning! That Gingerbread house is very pretty. Congratulations sis. I am not surprised because you are so good e. Very nice sis. Good job, Melgie! You are one talented cuisinera! I love your white and green them. Consistent sya all through out your design. Well deserved! Congratulations! You did a great job! Wow! What's the prize? hehehe.. so excited to see it. And indeed you deserve to win sis! Wow! Congratulations! The gingerbread house was very Christmassy. You deserved to win, Melgie.